Turtles are known as an “indicator species” because they can be used as a barometer for the health of the entire ecosystem. By understanding the possible effects endocrine disrupting chemicals have on turtles, researchers might be able to understand the possible effects such compounds have on other species. Mitochondria are the “power house” for cells and are responsible for breaking down and converting nutrients into usable energy. Ribosomal pathways produce proteins, which are needed to repair damage and direct chemical processes. Increased energy production in brain cells can thus affect cognitive flexibility and memory. 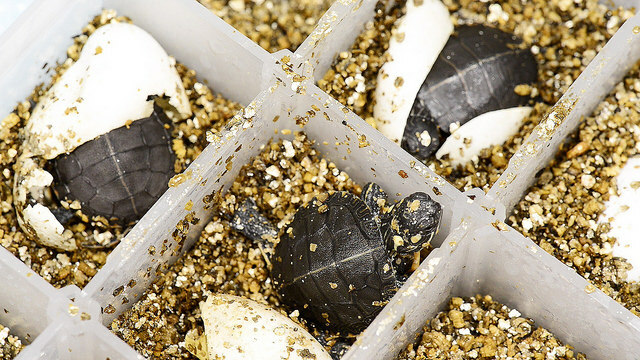 Rosenfeld notes that this is the first study to show a correlation between changes in gene expression patterns and behavioral changes in turtles exposed to endocrine disrupting chemicals. “Correlation of altered gene expression patterns with the behavioral changes of the animals almost a year after the original exposure indicates that developmental exposure to BPA can lead to long-lasting and likely permanent effects on neurobehavioral responses,” Rosenfeld said. “Transcriptomic alterations in the brain of painted turtles (Chrysemys picta) developmentally exposed to bisphenol A or ethinyl estradiol,” recently was published in Physiological Genomics and is slated to be featured as a cover illustration on the journal’s website. Lindsey Manshack, a graduate student in Rosenfeld’s lab in MU’s Bond Life Sciences Center authored the study. Dawn Holliday, adjunct assistant professor of pathology and anatomical sciences in the MU School of Medicine and an associate professor of biology at Westminster College in Fulton, Mo., and Sharon Deem, director of the Saint Louis Zoo Institute for Conservation Medicine, contributed to the study. Funding was provided by Mizzou Advantage, the Office of Research and the Bond Life Sciences Center at the University of Missouri. The content is solely the responsibility of the authors and does not necessarily represent the official views of the funding agencies.